We are open Tuesday through Saturday from 9 a.m. to 5 p.m.
We are closed on Sundays and Mondays, January 1, Thanksgiving Day, Christmas Eve and Christmas Day. It generally takes 3 to 4 hours to tour the entire Park. We recommend that guests plan to arrive at the latest by 1:30 p.m.
From Downtown Houston take 59 southwest past Sugar Land. Take the Grand Parkway / 99 / Crabb River Road Exit and turn left (south) onto Crabb River Road. Continue 6 miles to the park entrance on the right. 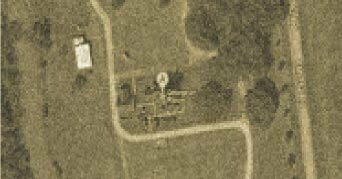 Often, when using a GPS navigation system, entering “George Ranch Historical Park Richmond Texas” will give better results than entering the actual address. >>Google Map the Park. Is there transportation at the Park? Yes. The Park is developed around a nearly-mile long loop and we have a tractor-drawn tram that circles every 20 to 30 minutes. Because the 1890s Davis Victorian Mansion and 1930s George Ranch Home display museum-quality artifacts, they are climate-controlled for humidity and temperature. However, the rest of the Park’s historical amenities (including the 1830s Jones Stock Farm, 1890s Sharecropper Cabin and Blacksmith Shop and 1930s cattle working pens and tree house) are all subject to the whims of weather. We suggest that guests wear comfortable, closed-toe shoes, stay hydrated and dress for the day’s forecast. Can I take pictures at the Park? We welcome guests to take pictures during their visit. The Park has a variety of natural and historical settings that make for beautiful photographs. To protect and preserve the furnishings in the historic homes, we ask that you do not use a flash when inside the 1890s Davis Victorian Mansion and 1930s George Ranch Home. For photo shoots, professional photography, and private sessions, please contact us for schedules, rates and fees. Where can we eat or stay nearby? There are a variety of restaurants located at both the intersections of 59 and Crabb River and the intersection of Highway 59 and 762. For local lodging, please check with the Central Fort Bend Chamber Alliance and/or Fort Bend Chamber of Commerce. We do not provide camping facilities. The closest camping grounds are located nearby at Brazos Bend State Park. Are you a State Park? We are a private facility and not affiliated with the Texas State Parks System. We’re sorry, but pets are not allowed at the Park. Do you have horses I can ride? Unfortunately, we cannot offer horseback rides to our guests. While we do have horses on site, they are part of our working staff and are the cowboys’ best partners. We provide plenty of free parking.